Top half of pear-green, ceramic pear is a salt shaker, and the bottom half is a pepper shaker A tiny, dark-brown stem accents the top of the salt shaker. Pear measures approximately 3 1/2" by 2 1/2" in diameter. 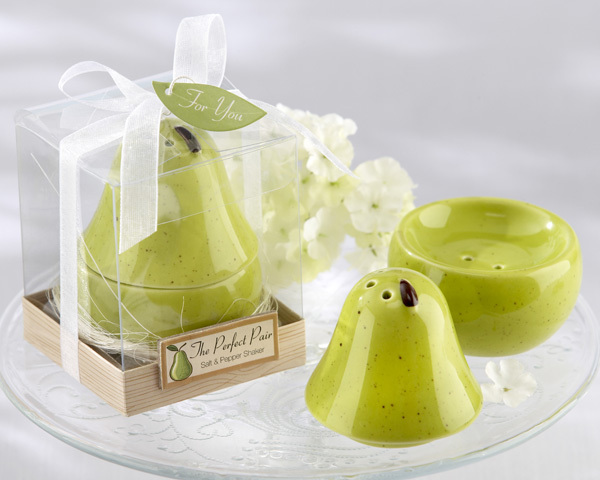 Ceramic pear sets in a bed of natural, shredded raffia on a faux-wood base inside a clear gift box. Gift box is accented with a sheer white, organza ribbon and bow with a green, leaf-shaped "For You" tag and a small, raised plaque with a tiny, green pear and the words The Perfect Pear Pepper Shaker on the front of the base.